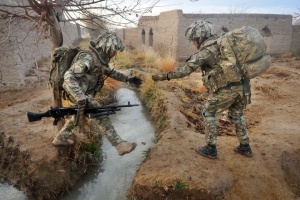 British-trained Afghan forces have demonstrated their expanding capability by successfully leading a large and complex operation to build a bridge over the Nahr-e Saraj canal in Afghanistan`s Helmand province. Soldiers from the Afghan National Army as well as members of the Afghan Uniform Police conducted a security sweep through the Lashkar Gah district of Helmand as part of the mission, aimed at consolidating improvements in security. This major operation was supported by British forces led by 1st Battalion The Duke of Lancaster�s Regiment (1 LANCS) who have been advising Afghan security forces in Lashkar Gah. The operation demonstrated some of the crucial capabilities that the Afghan security forces have developed in recent years, including the installation of vital infrastructure and detection and disposal of improvised explosive devices (IEDs). It also included a bridge-build across the Nahr-e Saraj canal, before a 72-hour period in which in excess of 50 IEDs and 240 kilograms of homemade explosives were found and dealt with independently of support from their British mentors. As Afghan forces� independence and capability improves, British and coalition forces will gradually step further back until Afghan forces operate with complete autonomy. Burma Company, part of 1 LANCS, returned to the UK early in December 2012 having handed over responsibility for security in their area to the Afghan Uniform Police, while Corunna Company, who supported this operation, will become an Advisor Team Enabling Company. The remainder of the battle group will return to the UK in April 2013.